This article explains how to monitor and manage your billing preferences. All actions listed in this article require you to be logged into your Account Center. 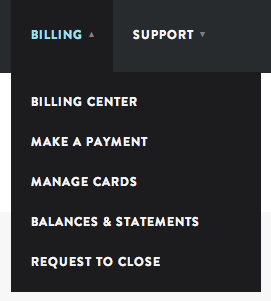 Click on the Billing tab at the top of your Account Center. Choose whether you want to Pay full balance or Pay different amount. Enter your desired amount, if needed. If you choose PayPal or PayPal eCheck, you will be directed to a new screen for that service. For instructions and screenshots, please see: Manual Payment Methods. Click on Add a card to add a new credit card. Fill in the information for your new card. To update a card on file, you must add it as a new card. For your security, it is not possible to directly edit your credit or debit card info. Refer to this article for additional help: How do I update my credit card? Click on remove next to an existing card to delete it. Click on make primary to change the primary card for your account. From this page, you will have the option to select from any of the invoices created over the entire lifespan of your account in the lower section marked Previous Statements. If you like, you can also select the option for automatic emailed invoices from this same page. Please note, these automated emailed invoices will be sent to the primary email address listed for the account owner if this option is selected. Step by step instructions are available here: Close a service or account. If you'd like to change your Payment method or Invoice/Statement delivery option, please submit a support request to our Billing administrators to request the change. Automatic credit card payment is enabled by default. Currently, if you would like to change your billing term from Monthly to Annual or vice versa, please submit a support request via your AccountCenter. You can also contact us via chat or telephone if you have any billing questions related to your (mt) Media Temple account. Our support team is here to assist you 24/7/365.